Free shipping. Buy direct from HP. 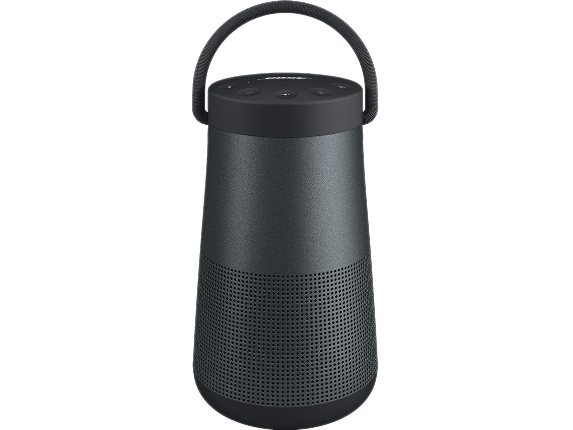 See customer reviews and comparisons for the Bose SoundLink Revolve+ Smart Speaker - Wireless Speaker(s) - Portable - Battery Rechargeable - Triple Black. Upgrades and savings on select products. This true 360° speaker was engineered to spread deep, jaw-dropping sound in every direction. That means, when everyone stands around it, everyone gets the same experience. If you set it near a wall, sound will radiate and reflect around the room, immersing you in that same feeling you felt at your favorite concert. And with a flexible handle, it's designed to go wherever you want to bring the music. No detail is too small. Not even a single seam. Notice our grille doesn't have one. That's because we created a new single-extrusion process to eliminate it-leaving nothing but beauty. A flexible fabric handle makes SoundLink Revolve+ easy to move. And it feels good, too. That's because we meticulously chose every material for this speaker-right down to the soft, smooth buttons that ensure every interaction feels as natural as you know it should.